Desk mounting solutions for a TV or PC monitor. 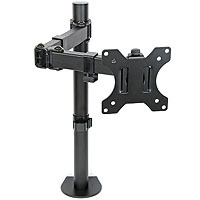 Monitor TV Desk Mount Arm Clamp Stand LDT12C012N This great value desk mount arm can support a single PC Monitor with 75mm or 100mm VESA fixings. Model: LDT12C012N.